Vinyl-acetate ethylene co-polymer emulsions (VAE) are one of the youngest children in the family of emulsion polymers. Initial experiments to introduce ethylene as monomer into the emulsion polymerization were done in 1950s and VAE was made commercial available in the late 1960s1. 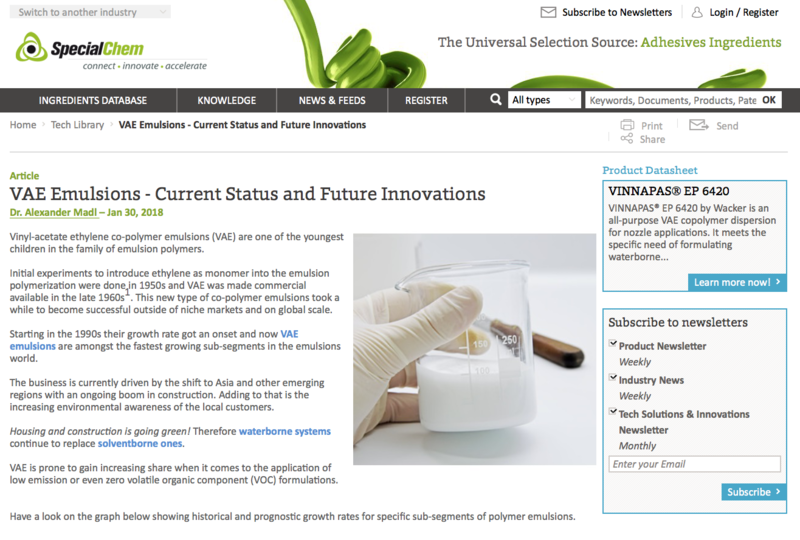 This new type of co-polymer emulsions took a while to become successful outside of niche markets and on global scale. Starting in the 1990s their growth rate got an onset and now VAE emulsions are amongst the fastest growing sub-segments in the emulsions world. The business is currently driven by the shift to Asia and other emerging regions with an ongoing boom in construction. Adding to that is the increasing environmental awareness of the local customers. Housing and construction is going green! Therefore waterborne systems continue to replace solventborne ones. VAE is prone to gain increasing share when it comes to the application of low emission or even zero volatile organic component (VOC) formulations. This entry was posted in Emulsion Polymers, Innovation, Publication. Bookmark the permalink.